Needham, Mass. -- Four long years have passed since St. Sebastian's last earned a NEPSAC postseason bowl bid. While there is still a majority of this season left to played, you cannot help but wonder if this year's group of Arrows have what it takes to reach that plateau once again. 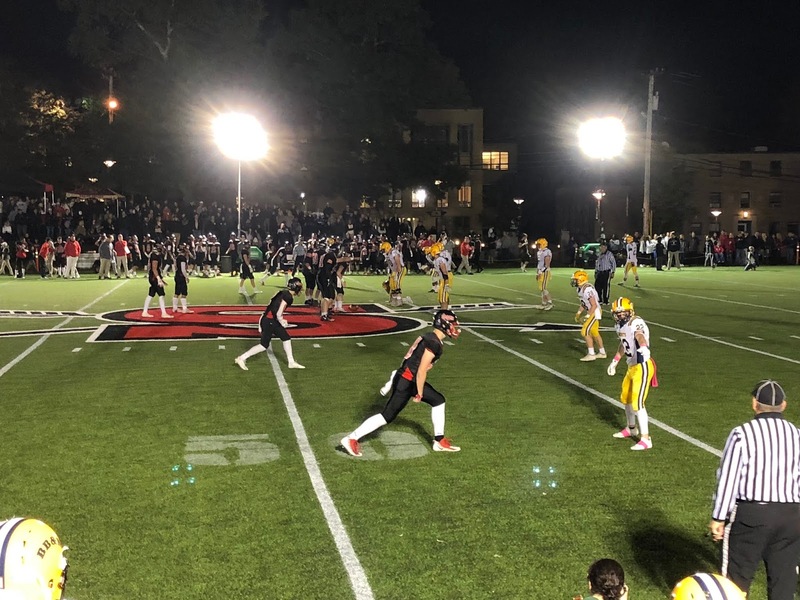 St. Sebastian's left no doubt that it is a team to be taken very seriously with a 23-3 dismantling of ISL rival, and previously unbeaten, Buckingham, Browne & Nichols Friday evening. The Arrows (3-0) were able to engineer some big offensive drives, but also relied heavily on a stingy defense to earn this triumph. Offensively, St. Sebastian's (3-0) racked up 307 yards of offense while limiting the Knights (2-1) to just 150. Two-way quarterback threat Billy Seidl proved to be a thorn in BB&N's side all night long. Headed to Duke to play baseball, Seidl put his football talents on display. The senior rushed for 162 yards on 22 carries and a touchdown. He also completed 7 of 17 passes for 108 yards and a pair of scores. "Tonight we had some opportunities that we were able to capitalize on," said Seidl. "We just came out firing and did our thing." Following a scoreless opening quarter, the Arrows got things started midway through the second. Driving 60 yards, Seidl connected with wide receiver Alex Cherry for a 17 yard touchdown to give St. Sebastian's a 7-0 lead. The Arrows had a chance to add to their total moments later after Peter Blake recovered a Matt Bulman fumble on the BB&N 42 but failed to capitalize. "I thought we were a little bigger and quicker," Arrows coach Bob Souza said. "We just decided that we were going to attack them and I thought our kids did a great job. They're tough kids. Also, our offense came up big when they needed to and made the plays they had to make. BB&N is a good team but I think we were able to take them out of their game a bit. It was a good win." After giving the ball back to the Knights on downs by failing to convert on the turnover, BB&N proceeded to march 62 yards setting up a Chris Chen 29 yard field goal with 52 seconds remaining before halftime. However, St. Sebastian's was not content to head into the break leading by just four points. On the ensuing possession, Seidl had a huge 46 yard run before hitting running back Bryce Gallagher on a swing pass which resulted in the Northwestern-bound senior blasting through the Knights' defense 25 yards and into the end zone, sending the Arrows into the intermission on top 14-3. Gallagher also contributed 80 yards on the ground. "Billy is one of the best athletes to ever come through the school," said Souza, now in his 40th year at St. Sebastian's. "He's a mature kid and the moment is never too big for him. He plays with a lot of confidence." During the opening half, the Knights lost their two starting running backs (Zach Cyr and Justin Moran) to injuries. Both would not return for the remainder of this tilt. Things continued to worsen for BB&N, who had beaten St. Sebastian's the last three years, in the third. After Anthony LaMonica picked off a Seidl pass at the 2 yard line, the Knights thought they had a new lease on life. But two plays into the drive, freshman quarterback Shane Hanafin was blindsided by defensive lineman Steve Jessup in the end zone resulting in a safety to make it a 16-3 contest with 4:44 to go in the quarter. Getting the ball back, St. Sebastian's put this one out of reach. Taking advantage of a short field, the Arrows drove 42 yards, capped off by a Seidl 27 yard gallop with 0:58 showing in the third. "I saw a hole open up and was able to shake off a couple of defenders," Seidl said. "Then I saw there was no safety there so I just kept running." That was more than enough leeway for the Arrows to work with. Although Bulman had a productive showing (99 yards on 11 attempts), the Knights' offense proved seemingly lackluster as they failed to make a dent in the final quarter. Hanafin, who spent most of the evening trying to elude St. Sebastian's defensive assault, was just 4 of 12 passing for 39 yards. With time winding down, his attempt to cut into the deficit fell flat with Gallagher intercepting a pass to seal the win. "We knew we were going to have the momentum right off the bat," said Gallagher. "I don't think they knew what to expect coming in here tonight. They thought we were just going to roll over for them but that's not what happen. We were able to punch them in the mouth in the first half and they just never responded. They're a good team but we out-played them tonight. Now we're hoping to just continue to play at our best and take things one game at a time."